July 9, 2018 Robert W.
LVCC banner poster stands are one of the most popular graphics at the Las Vegas Convention Center at 3150 Paradise Rd, Las Vegas Nevada 89109. There are several reasons why they are so popular, but 3 reasons stand out. Poster Banner Stands are inexpensive. 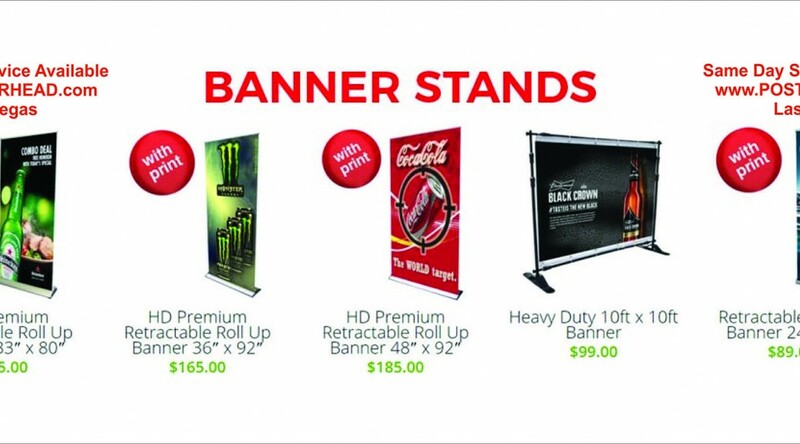 LVCC banner poster stands are very cheap to purchase and several of the banner stands start off at less than one hundred dollars. These stands can be used many times and all come with a carrying case. Many different poster banner stand models are available in a multitude of sizes and also in deluxe or premium models. Poster Banner Stands are easy to set up. The average time for a banner stand to be set up is less than 2 minutes. These stands are self standing and require no attachment to a wall or other structure for support. Being self standing allows people to place them anywhere inside their booths. Poster Banner Stands are big. LVCC Banner Poster Stands are large and can contain a lot of information on them for people to look at. The average size of one of these stands is approx. 3ft wide by about 6 feet tall which allows for approx. 18 square feet of space to print pictures/ logos and information about the products and services you are promoting. These banner stand graphics are full color and can contain as many colors on the graphic as you would like. Designing a banner is easy if you have the right design equipment software as found here: https://posterhead.teachable.com/p/making-a-banner . See why many vendors at the big convention venues like the banner poster stands. Contact a local sign company near the LVCC or simply bring a banner stand with you when you come to Las Vegas to display at the convention venue and discover for yourself why they are so popular.